The magnetic grip is fast and reliable: operators no longer have to perform dangerous actions to hook jaws, bands, chains or other lifting systems. For shorter products, there is the chance to pre-select only the magnets involved in the taking. The magnetic anchor from electromagnetic beams allows you to stack the products or the bundles one directly on each other. For the magnetic lifting of sheets, bars or slabs a version of lifting beam with electro-permanent magnets can be required. Energy-efficient, electro-permanent magnets avoid the risk of load losing due to electrical faults or power failure. 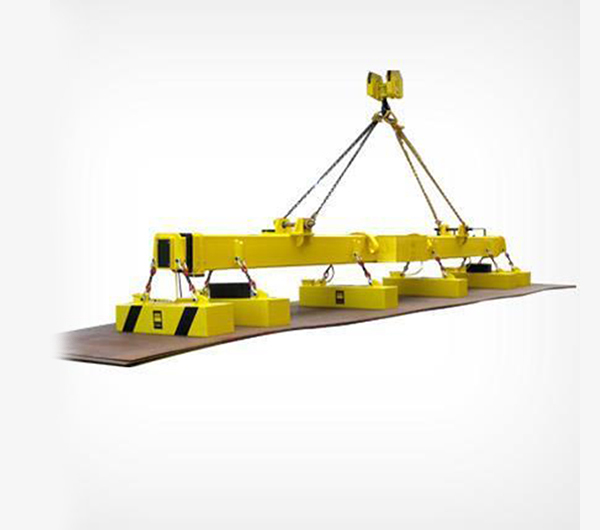 We can design your magnetic lifting system according to special requirements of available space, weight and dimensions of the material to be handled and the capacity of cranes.